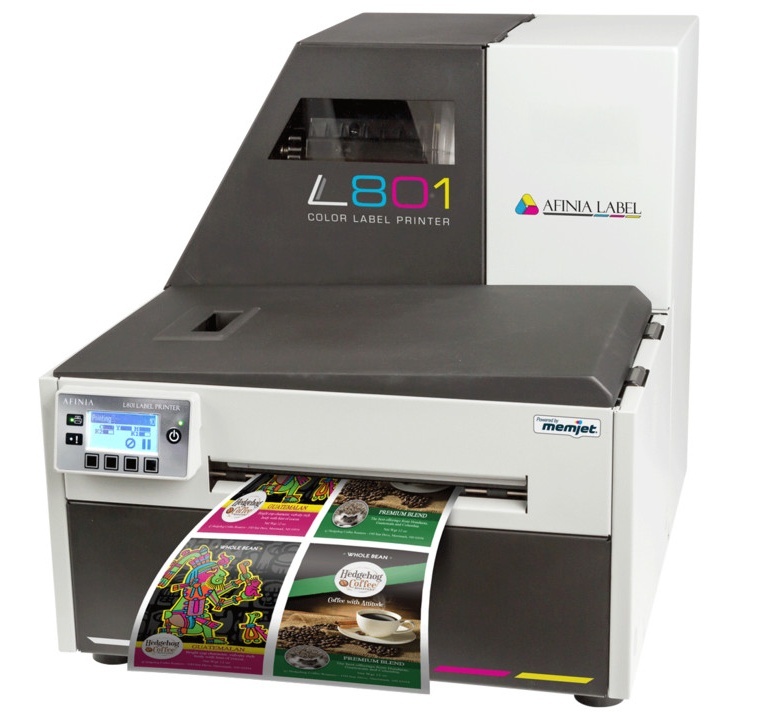 Afinia Label L801 Memjet colour label printer is an industrial web-fed inkjet solution, ideal for short- to medium-range print runs for inventory and product identification applications. It’s easy to use, has an integrated unwinder, works well with industry-standard label design software, and is available with an optional rewinder. The L801 is compatible with a wide range of paper, polyester, polypropylene, and vinyl label stocks from major vendors. With the correct label stock, the L801 can create GHS-compliant labels. The L801 Industrial Colour Label Printer is a Memjet label printer that uses Memjet technology, allowing you to print high-impact, full-colour output at up to 60 ft/min (18 m/min). Memjet’s stationary “waterfall” printhead technology allows paper to move quickly through the printer, while maintaining excellent print resolution. Digital printing has grown significantly and digital label presses are becoming more common in “traditional” print shops. Using the L801 industrial colour label printer, you can print at up to 1600 x 1600 dpi for vivid, eye-catching labels. By using CMYKK, the L801 offers exceptional colour and rich blacks, giving you the ability to print with better contrast. The L801 Memjet label printer is an industrial web-fed inkjet solution, ideal for short- to medium-range print runs for inventory and product identification applications. It’s easy to use, has an integrated unwinder, works well with industry-standard label design software, and is available with an optional rewinder. The L801 is compatible with a wide range of paper, polyester, polypropylene, and vinyl label stocks from major vendors. With the correct label stock, the L801 can create GHS-compliant labels. per second, resulting in what we call 'waterfall technology'. short, high quality print runs. simple media and ink replacement. An optional rewind unit is also available. Afinia L801 Label DLP-2000 Ink L801 Yellow - 250ml Volume. Afinia L801 Label DLP-2000 Ink L801 Black - 250ml Volume.